Russia is preparing for War. Huge Russian buildup underway. German foreign minister recently said, “We’ve never been closer to WWIII than now.” Russia is perfecting its nuclear missile systems while it is preparing its people for war. Why is this happening now? We have had such a bizarre election. We’ve never had the two leading candidates accuse each of other of being a Russian puppet. But the evidence suggests, from the “leaked” Podesta emails, that Hillary is the real Russian puppet. “Our policy is to strengthen Russia” HRC said when she is Secretary of State. The Russians are pretending to support Trump. “They are blowing poison kisses at Trump” (Nyquist). They are worried that Hillary won’t win. The American people are in disbelief. They don’t take the Russian moves seriously. The mainstream media isn’t paying attention. No one in the U.S. seems to care. FBI disclosures, from a high-level source, via a memorandum from the past week. The real point of interest is the Clinton Foundation, not the private email server per se. “Connections implicate many individuals across the Federal Government — that are guilty of treason.” Has the FBI found treason throughout the government at high levels? Is it doing something about it now behind the scenes. Is something going on that is causing government officials to prepare themselves to run for cover? Stunning: Several key democrats are preparing to use the 25th Amendment to remove President Obama. Their fear is that he won’t defend the country if it is attacked. People at the FBI caught on to what was happening over a year ago and apparently began “flipping people” to disclose information about the long-standing plans to covertly overturn the Republic. The most likely scenario: many individuals involved in implicit treason were identified and given an ultimatum: Tell us the dirt on the higher level conspirators or go to jail. This scenario is very different from what Mike Drudge, Alex Jones, and others discuss. It is coming from the FBI memo from inside sources that Jeff has… that something is getting ready to happen that NO ONE has predicted was going on behind the curtains. Remember: Obama and Clinton were trained by communists. Frank Marshall Davis and Saul Alinsky. Russia’s threat is actually pointed to the FBI: “You are not going to remove our agents throughout your government”. Why are elites moving so much money to Dubai? They are preparing to flee the country. The Clinton Foundation just moved $1.8 billion. Is Trump really way ahead in the election? Are they realizing that they aren’t going to be able to steal the election and therefore, their crimes will be brought to light and they will flee the country? The FBI memo indicates that Trump has been briefed on this. Webbots’ prediction—a think-tank that captures linguistic data across the Web and discerns trends and makes predictions. THEY ARE PREDICTING A TRUMP LANDSLIDE. This will trigger a financial collapse and probably a Civil War in the U.S. The story that is forming is not a story we would expect. Most people assume that Marxism is dead and died with Joseph McCarthy. Americans don’t assume that communism and Russian agents within our federal government are a threat. “The communist party is alive in America”. They officially have endorsed HRC. Jeff attended a meeting in 1982 and learned of their plans to infiltrate the Democrat party. They would eventually elect a “stealth” communist president and turn the U.S. into a socialist nation. Does Trumps possible success a catalyst for Russia’s mobilization? “Yes” according to Jeff. Russia really supports Hillary and if she loses and Trump wins, the Russians could move militarily. This is opposite the way it is being posed by Alex Jones. Stunning that the Democrats are worried that Obama wouldn’t defend the country. What’s the process in “flipping”? If the FBI found out the puppet strings lead back to Russia, it would take action. We know that HRC and BHO made a complete mess out of the Middle East. We liberated Iraq, paid $1.5B to Iran, and we get nothing for it. While Russia mobilizes, we continue to disarm. The window of greatest opportunity for Russia to attack. The FBI wouldn’t move too fast without making sure they have little chance for push back, accusations that they are the real traitors. The FBI hopes that Trump wins, that they can work with Trump to clean it up. If Trump doesn’t win, the risk of Civil War becomes very high. Vincent Peter Pry, The Longest Sunday, Election 2016. Brand new book that provides information on why there is an immediate threat and lays out the scenarios. Pry shows the steps, the progression of the four major enemies (Russia, China, North Korea, Iran), and how they would do it. The implications go beyond dire. The first step is the EMP attack. It only takes a small nuclear weapon, only 10 Kilotons (comparable to the Hiroshima bomb). And to deploy this, to detonate it, requires much less sophistication than a nuclear bomb targeting a specific military target or city. The EMP Commission for Congress, published a report (believe it was in 2004). No one has done anything despite the grave findings. “The ultimate cyberwar weapon”. Pry says history is repeating itself, just like before World War II. Japan attacked on a Sunday, right before Christmas, when America was completely off-guard. Jeff: “EMP is a precursor attack weapon”. Pry and James Woolsey, former CIA Director have attempted for a decade to get Congress to act, but to no avail. Two bills have stalled that could fund the protection of the grid. While not that expensive to do, our Congress won’t do it. It is baffling. Meanwhile, China, Russia, and Iran have developed such protective technologies to protect their grid and sensitive systems. And of them could use an EMP to knock out the U.S.’ ability to retaliate. 90% of the country’s population would likely die within 12 months if this attack occurs… from starvation and disease. Our society totally depends on electricity. 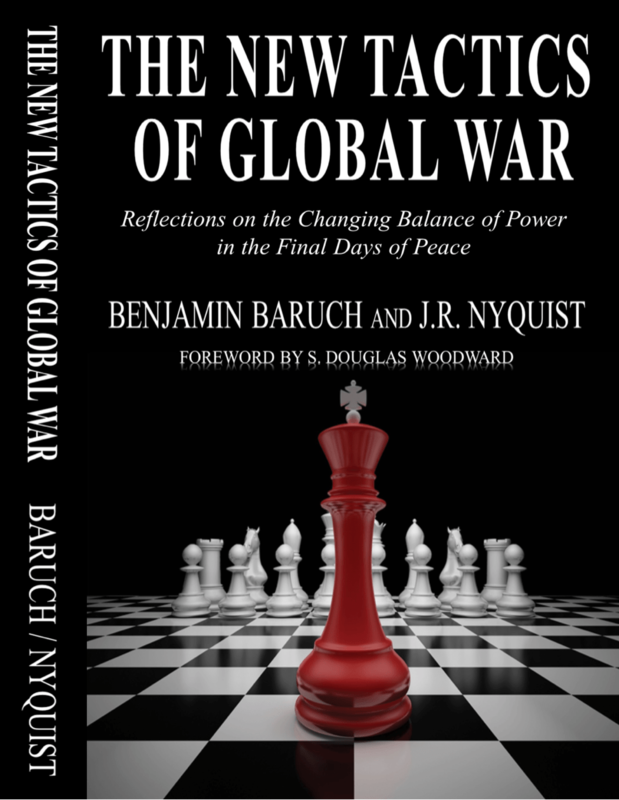 For more details, the three published a book, THE NEW TACTICS OF GLOBAL WAR that goes into details on Russian political and military strategy. J.R. Nyquist coauthored a book RED JIHAD with Cliff Kincaid. Doug Woodward has published two books on the topic: IS RUSSIA DESTINED TO NUKE THE U.S.? and THE NEXT GREAT WAR IN THE MIDDLE EAST. All of these books are available in Paperback and in eBook Format. You can find then today at Amazon.com. S. Douglas Woodward’s books are available at Amazon on his author page HERE. Previous PostREVISING REALITY: THE FIRST REVIEWS ARE AMAZINGNext PostARE AMERICANS AFRAID OF THE FUTURE?